The University of Washington Association of Chemical Engineering Graduate Students (ACES) is committed to providing its students with opportunities for professional development and outreach beyond those typically encountered during graduate studies. Of our activities, the Graduate Student Symposium (GSS) best bridges the gap between industry and academia. For industry representatives this event provides a chance to learn about the exciting research being done at the University of Washington, meet future research leaders, and help improve the quality of graduate education in the Chemical Engineering department. For the past eight years the GSS has grown to be an important forum for both graduate students and industry representatives. We hope to make the 9th annual event the best yet! 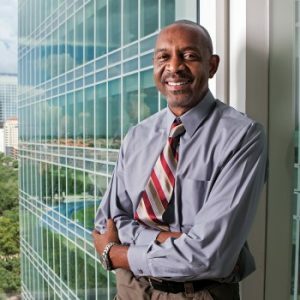 A keynote address by Robert Satcher, Jr., PhD, MD who has used his extremely successful career as an Orthopaedic Surgeon and his formal training as a Chemical Engineer to understand the unique challenges of practicing medicine in remote locations including under near zero gravity. Dr. Satcher’s career includes logging over 250 hours in space and highlights the juxtaposition of chemical engineering and medicine. He currently focuses on the field of telemedicine and telesurgery for cancer care. He is currently an Assistant Professor of Orthopaedic Oncology at the University of Texas MD Cancer Center and a member of several NASA committees, institutional programs. For more information, contact Emily Ruskowitz at ruskowit@uw.edu or RSVP today!